Oh, to live in such a place and come home to that blue door. Beautifully framed by those wonderful purple flowrs. It is so pretty! The flowers are gorgeous too. Wonderful shot, JM... As much as I enjoy the fabulous castles and grand homes you show us, this is endearing in its simplicity. Beautiful! I love the scrollwork on the blue door--and the flowers! This is a welcoming sight! beautiful entrance , you're lucky to have such lovely flowers ! What an exquisite capture, JM! Love the door and, of course, the beautiful flowers! What a lovely, warm and welcoming sight to come home to! This is a perfect scene! I love the way the colors work together. Whoever lives there must have a green thumb. Is it where you live JM? I would love if it was the door of My house! ADORABLE! 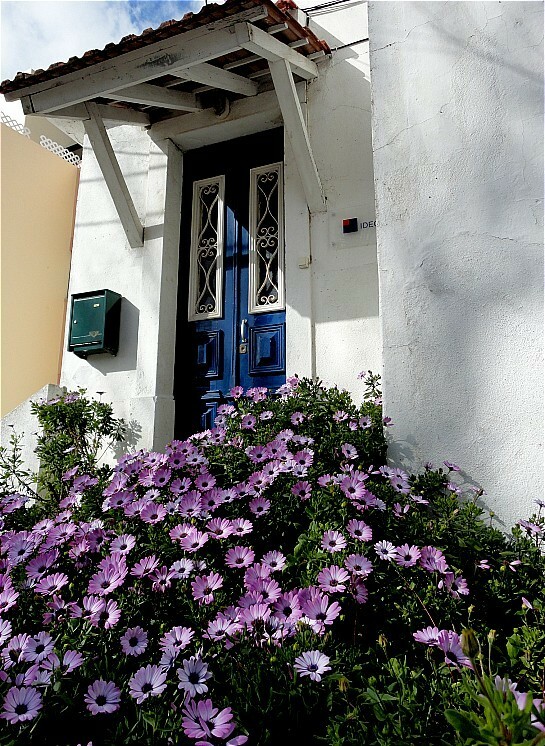 The blue door and purple flowers made for a beautiful photo! We'll have to wait another 3 months for flowers like that over here! Nicely done, you found the most perfect angle for this shot and got a great depth of field. Masterful! I love those daisys. The door really brings out their color. I always think blue doors open to peaceful and happy home. The purple flowers are an extended welcome carpet I think! Beautiful shot! Beautiful door! Beautiful flowers! Beautiful composition! This is just plain gorgeous ... looks so inviting. The colours of the flowers and door complement one another and I love the composition. Simply wonderful: great composition, fine colors. Oops, I missed this! Sorry JM! I like purple and blue together...in fact I've got some purple and blue shirts. The door would be quite striking in any color, but the dark blue is nice against the white stucco and the flowers bring vibrancy to the scene! Charming with those purple flowers. Has spring begun for you? It is really charming with those purple flowers. Doors now, are sometimes the reflection of what is inside the house or what kind of people live inside it. Sometimes exterior and interior designs here in St. Louis are placed accordingly to match the characteristics of the person. And I guess, the person behind that door is very hospitable coz' the door look very inviting.